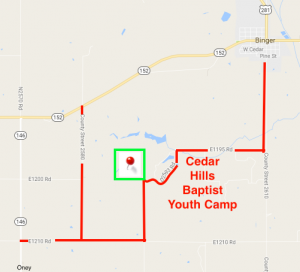 Cedar Hills Baptist Youth Camp covers 160 acres and is located approximately 2 miles south and 3 miles west of Binger, OK. The camp was established in 1980 as a ministry of Oakdale Missionary Baptist Church in cooperation with the Baptist General Assembly of Oklahoma. The purpose of the camp is best stated in Proverbs 22:6, “Train up a child in the way he should go; even when he is old he will not depart from it.” Sand rock hills, miles of hiking trails, many amazing views, and a ten-acre lake provide ample opportunities for visitors to experience God’s creation. The camp is able to host over four hundred guests in the climate controlled dorms, cafeteria, and worship accommodations. Recreation areas include a large pavilion, basketball courts, sports fields, sand volleyball court, and swimming pools. Click the facilities page for more details.